The older i grow, the more convinced i am that satisfaction associated with expensive physical items is disappointingly fleeting. Unique experiences on the other hand fill your shelf of memories with a never-ending joy. While the Birkins and Blaniks you thought you always wanted lay desolate in the back of a closet in exchange for a simpler life and much needed foot comfort, memories created on adventurous travels, road trips, and quality time spent with loved ones is a gift that keeps on giving. And so to commemorate three decades of life, four years of courtship, and two years of marital bliss, we decided instead of ever-again buying ‘things’ that will soon be useless or forgotten, we will indulge in experiences that stay with us for a lifetime. So we got-away to live on a private island along the coast of Maine to examine our mainland life. 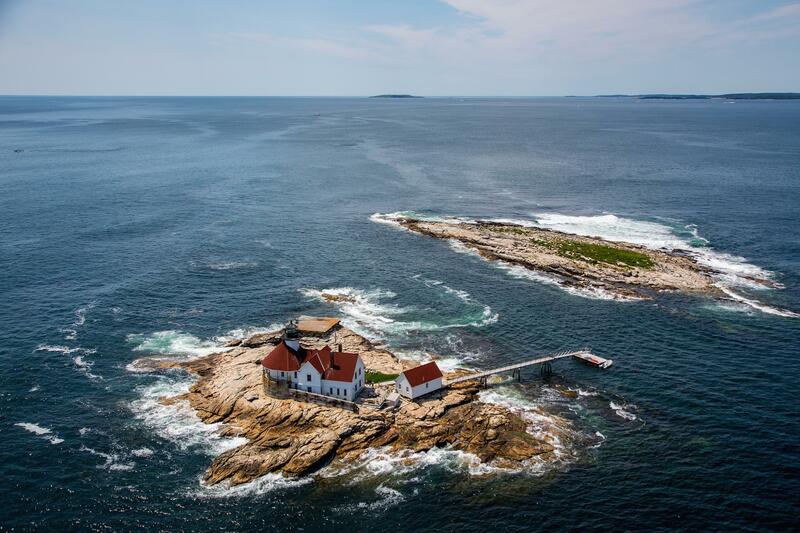 Cuckolds Lighthouse island is one such magical location in the North Atlantic ocean that brings you closer to nautical adventures out on the rough seas and leaves you marveling at the dare-devilry of brave maritime explorers. Sometimes you need to be where blue whales swim by blissfully, seals and sea gulls nest unabashedly, and extreme solitude dwells, to take stock of your life. A couple of hours drive from Boston, you check-in to a fragrant lavender laden property from which you can look out to Cuckold’s island. An array of cocktails concocted by Captain Bruce and a couple of waivers later, luggage on board, you embark a suave boat that takes you to the island. As you watch the lighthouse nearing, the excitement is almost palpable. Blue seas and butterflies. Heather and Mark are waiting to welcome you on the dock. The fabulous island-sitters and hosts who also double up as five-star chefs/ musicians and captivating story-tellers! As soon as you dock, a few safety instructions later, you take a tour of the lighthouse island. It is wise to pay close attention and absolutely adhere to island rules; the island is rocky with waves thrashing almost 15 feet during high tide. Frankly, the thrashing of waves on some nights is positively scary. No wonder you have to be 18 years or older to be even allowed on the island. It is also not uncommon to witness sudden changes in weather within a matter of minutes, so pack appropriately. The lighthouse itself was renovated numerous times since 1867 when it was first built for the keeper and his family. The state of the art plumbing and electric wiring is connected to mainland via the sea-bed. The light house is still functional and you can go up there any time except at night when the lights go on, unless you want to be blinded by its extremely high-powered beams! What can you do on the island itself you ask? With absolutely NO wi-fi, the possibilities are truly endless! Indulge in some vintage board games. Read classics from the lighthouse library. Build and fly kites in the north Atlantic ocean breeze. Lounge about the comfy suite. Sleep in. A lot. Stare out the window at marine life. Look out at migrating whales in the distance. Meditate to the calming sound of rising and falling waves. Watch barnacles open and close. Enjoy the elaborate evening tea and cheese plates, wholesome breakfasts, baked treats, and three course lobster dinners that Heather prepares with absolute love and precision. Challenge each other to a round of Jenga. Sit out by the rocks watching seals and gulls on the island next door. Wonder about secrets the deep blue ocean holds. Step out on the island at night in freezing temperatures looking out into the endless starry sky. Check items off adventurous bucket lists. Thanks for such a wonderful memory captured Heather! Like i said the possibilities are truly endless. At the risk of overly romanticizing this experience, consider that among the numerous uneventful days that we barely recollect, investing and sharing in a fantastical experience adds much required sanity and momentousness to our otherwise mundane lives. Honestly, this post is not really about living on the island even. Sometimes, you need to remove yourself so far away from daily reality to even begin to recollect the moments slipping by, assess why that is, and wonder how they can be made more memorable in simple ways, if at all. After all, memories are what we take with us in our mind’s eye for years to come. While the bags, the shoes, and all else physical wither-away into oblivion as if they never really existed. Leaving island life behind is hard, but taking memories back with you, now that is something we all can do. Like all other fabulous experiences, island-living is short-lived. The real trick is to practice living intentionally and wholly in every moment there after. A little solitude away on an island sure makes it easier back on mainland. Would love to hear about the last time you took stock of life via a unique experience? The last time you consciously decided to invest in memories instead of a material possession. Here is hoping to fill life’s shelf with exuberant memories. This is not a paid/sponsored post for Cuckolds, only mere reflections on the profound upside of investing in real experiences vs. spending on material possessions. This is such a refreshing read. And yes, material items only impress and satisfy to a point. The trigger of senses comes with an expiry – when it is a product that you are looking at. Experiences, however, just like whiskey in a barrel – gets better, ages, and gives a totally different sensory experience for a lifetime. Best wishes for your future travels, and keep up the good writing! Thanks for the note Ramit. Absolutely agree with everything you said 🙂 Really appreciate the encouragement! You should continue to do what you do as well… i know for a fact that you inspired dozens of AITians to take up and pursue their passion in photography! All the best & keep capturing fabulous life moments.